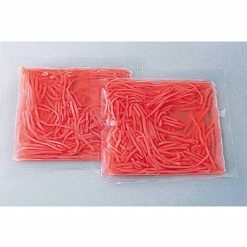 A petite pack of red pickled ginger that has been beautifully and vibrantly colored with plum vinegar-based vegetable dye. Pickled ginger is a renowned palate cleanser, and is often eaten between different types of sushi for this purpose. It is thought to help digestion and reduce inflammation, ensuring that the period after you eat is just as enjoyable as the meal itself. Because the amount consumed is generally quite small, adding pickled ginger to dishes is a great way to maximize flavor without maximizing calories. Place the bag as is in the refrigerator and allow it to slowly thaw. Once it has thawed, it can be immediately served. After it has thawed, please store it in a sealed contained together with pickling marinade and consume it within a relatively short period of time. 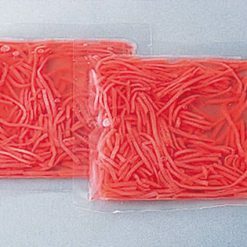 In addition to its famous role in sushi restaurants everywhere, red pickled ginger is a fantastic addition to yakisoba, takoyaki, okonomiyaki, and any other fried dish. The crunch adds interesting texture, and the striking, yet supremely palatable flavor will do a good job of shaking up any recipe. Note: If this red pickled ginger is thawed too quickly, the pickled raw ingredients will not return to their ginger form, and the texture will be tarnished. Please be sure to take your time in order to best enjoy this delicious product. This product contains ginger (China), pickled raw ingredients (brewed vinegar, plum vinegar, salt, red radish coloring, purple sweet potato coloring, (includes raw wheat).